Ever been energetically slimed by someone else’s funky juju? Sometimes it’s so sticky you have to soak it off. 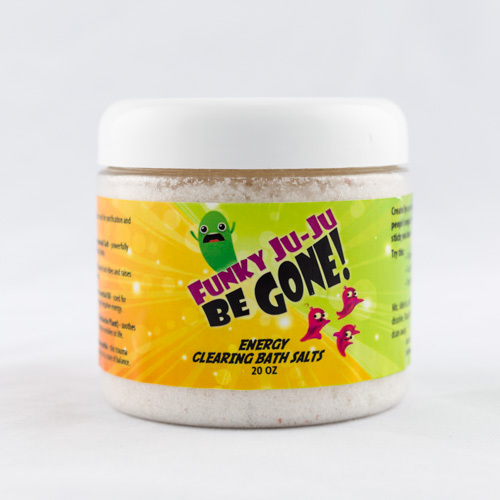 This energy clearing bath salt was designed with healthcare workers and highly sensitive people in mind. It’s great after a long day at the office to help clear away energy that does not belong to you, lightening your energetic load to help keep you clear and vibrant. It may be used as a hand rinse, foot soak, or in the bath to soak it out from head to toe. All ingredients are of the highest grade and have been chosen specifically for their clearing, balancing and protective qualities. Made with 100% essential oils. Holy Basil – sacred plant used for purification and emotional balance. Alaea Hawaiian Ceremonial Salt – powerfully protects against all things funky. Pure Ocean® Atlantic Sea Salt – clears away the jangly energy and activates the throat chakra. Omani Frankincense Essential Oil – used for thousands of years to dispel negative energy. Spilanthes Acmella (Toothache Plant) – soothes the pain and smooths out the wrinkles in life. Arnica Montana (Wolf’s Bane) Homeopathic – this trauma healer helps return you to a state of balance. 20 oz Jar = $17.95 + shipping costs. Mix, slide in, and steep for 20 min. Then feel the funk ooze out your pores. When fully soaked, thank the water for all its help, pull the plug and just let it all drain away.